Remove dry, dull layers of skin to reveal fresh, bright skin with microdermabrasion at our Med Spa. Does your skin appear dull and lackluster? Has that fresh glow you used to have seem to have faded? Do you have spots of discoloration, fine lines, or residual reminders of acne? Age, breakouts, and exposure to the sun and environmental elements could be causes. It’s just not quite time for an invasive procedure like a face-lift, but you’re looking for more than a basic peel. At Georgia Dermatology Center Medical Spa we offer a variety of chemical peels or laser resurfacing treatments to choose from. But you might want to consider the benefits of microdermabrasion to get a smoother, more glowing appearance. Dermabrasion abrades (wearing away through friction) the skin by removing the surface layer. Tiny (micro) rough grains of crystals or diamonds are used in the process to augment the friction capability of bristle tips attached to a hand held vacuum massaging device to peel off the outermost surface of the skin which is made up of dead skin cells. These dead cells act as a protective barrier over the new skin cells underneath, but over time can build up, resulting in a dull, discolored skin tone. By removing the surface layer the underlying layer of new skin is exposed, revealing fresher, smoother skin and minimized fine lines, blemishes, sun damage, and discoloring. The benefits of microdermabrasion are not only limited to the face, but can also improve the appearance of your skin on the neck, arms and hands. 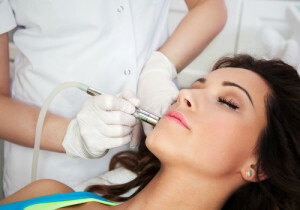 As well, microdermabrasion is appropriate for all skin types, even those with sensitive skin. Besides revealing fresh, new skin cells, microdermabrasion also increases blood flow to the surface of the skin.The massaging action creates a flushing effect, thus increasing oxygenation which encourages cell renewal. The procedure generally has few side effects aside from a pinkish hue to the skin,so you can return to normal activity fairly quickly. The procedure can be administered to patients ranging from age 12 and up and can be repeated about two weeks depending on the skin’s sensitivity and tolerance. In fact, it is recommended that microdermabrasion be conducted on a regular basis since our outer skin layer typically regenerates itself every 30 days. How Do I Maintain the Results of Microdermabrasion? Although there are minimal side effects, the staff at Georgia Dermatology Center Medical Spa recommend a specific skin care regimen following a microdermabrasion treatment. It is advised that sun exposure be limited a full 72 hours following the treatment, as well as avoidance of any source of excessive heat, such as saunas, hot tubs, and steam rooms. As always, using a good moisturizer and sun block is imperative. In addition, the application of retonoids and glycolic acid-based creams should be deferred a minimum of 3 days prior to, and 3 days following your microdermabrasion treatment. Book an initial free consultation with our Licensed Estheticians at Georgia Dermatology Center Medical Spa. We will evaluate your skin and determine the number of microdermabrasion treatments appropriate for your skins type and what you are intending to achieve from the process. We will work with you to learn as much as possible about all aspects of your treatment.